EWE studio is a design office based in mexico city, dedicated to creating handcrafted limited edition sculptural and functional objects. the studio is devoted to the preservation and advancement of mexico’s rich artisan heritage, and embraces new mediums and languages for the execution of each piece. mexico city-based EWE studio has revisited their native heritage of artisanship for its ‘alquimia’ collection — a series of three functional objects informed by the element of fire. the designers — héctor esrawe, age salajõe, and manu bañó — sought to emphasize the evolving techniques that artisans have mastered over last centuries. ‘alquimia’ features a mix of disciplines from different workshops that transform ordinary objects into unique pieces, shaped by the hands of master makers. 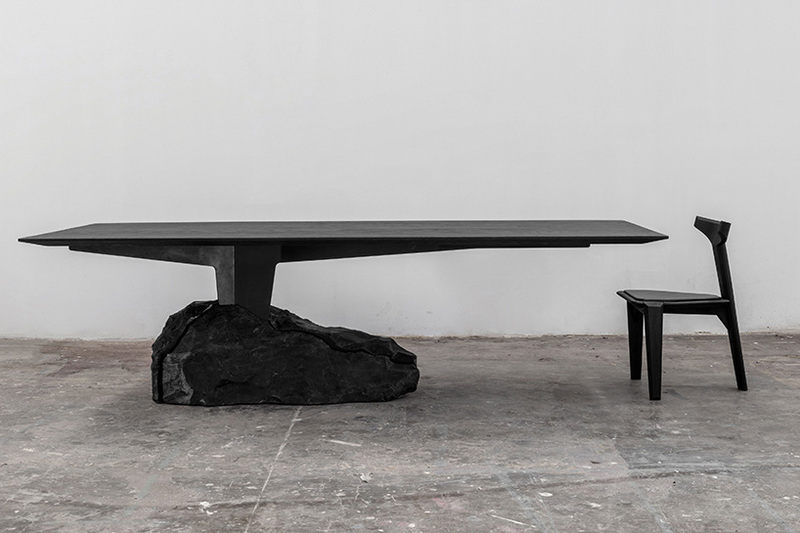 ‘alquimia’, presented at the 2018 edition of zona maco art fair in mexico city, comprises a chair, a table and a lamp. fire played a significant role in the transformation of all three pieces, altering and changing the characteristics of the materials involved. 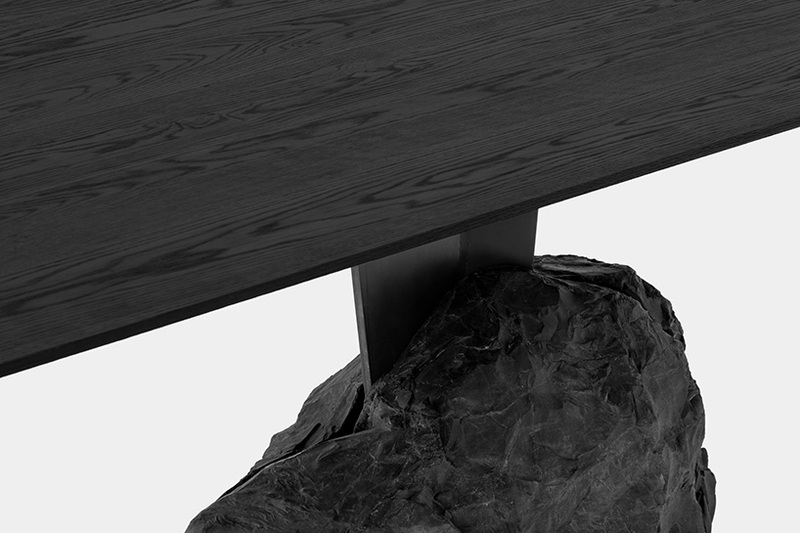 wood, steel and blown glass are the primary mediums, generating fascinating textures and mesmerizingly rich hues that define EWE studio’s experimentation with shape, material and balance. 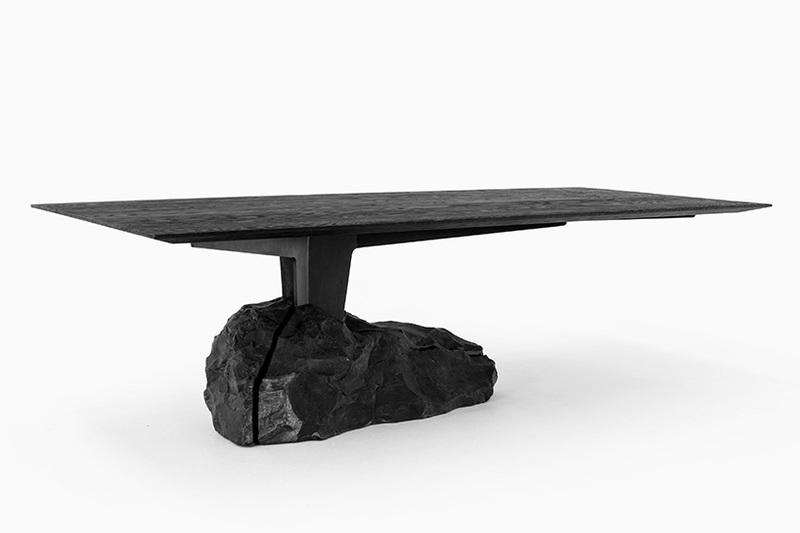 the centerpiece of the collection is ‘humo table’, a 2.6 meter long dining table that seeks to create a visual balance based on counterweight. 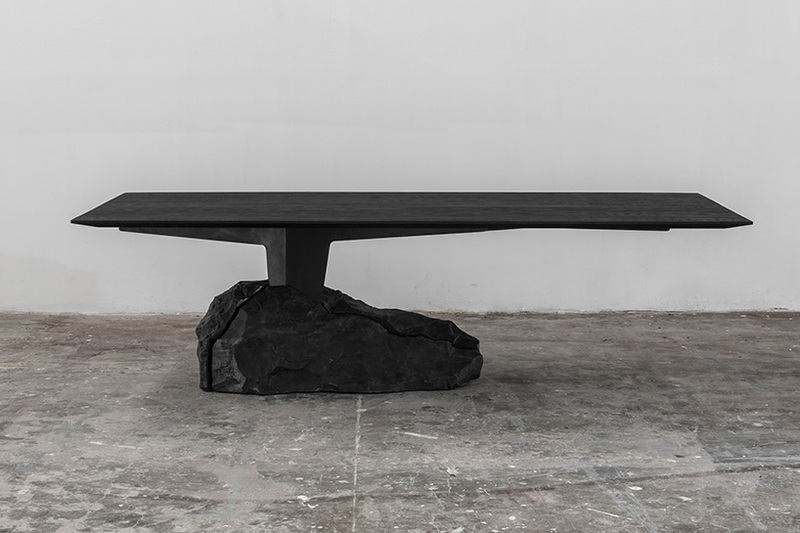 the body is made of oiled and burnt steel, sealed with a burnt white oak cover and held together by a 300 kilograms of mexican orizaba black marble. 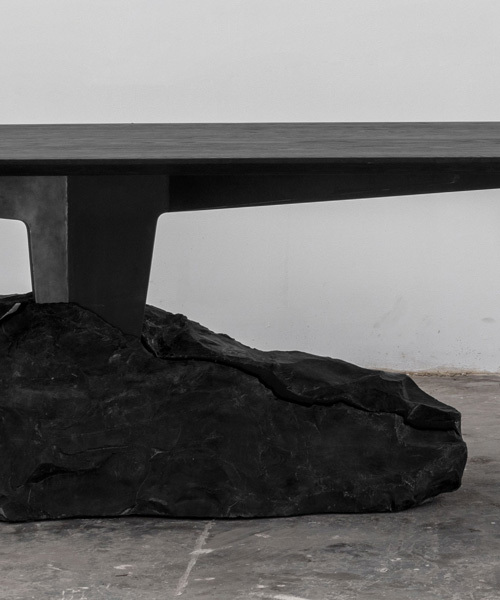 the designers sourced the stone from black marble quarry, looking for a material with enough weight, personality and size to support the rest of the structure. ‘it was important that the shape of the stone was carved by the mountain and the environmental conditions,’ they describe. a two inch white oak top has been burnt with a handheld torch drawn from the japanese ‘yakisugi’ technique, protecting the wood from weathering giving it a unique color and texture. 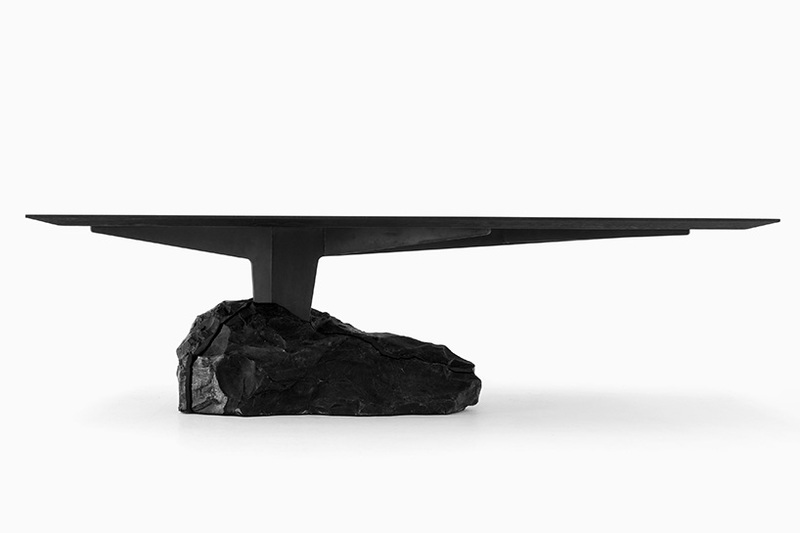 the two additional pieces in the collection are also informed by the element of fire. the three legged ‘ceniza chair’, connected using an ancient technique called espiga vista, is made from sealed burnt white oak with a black leather seat. 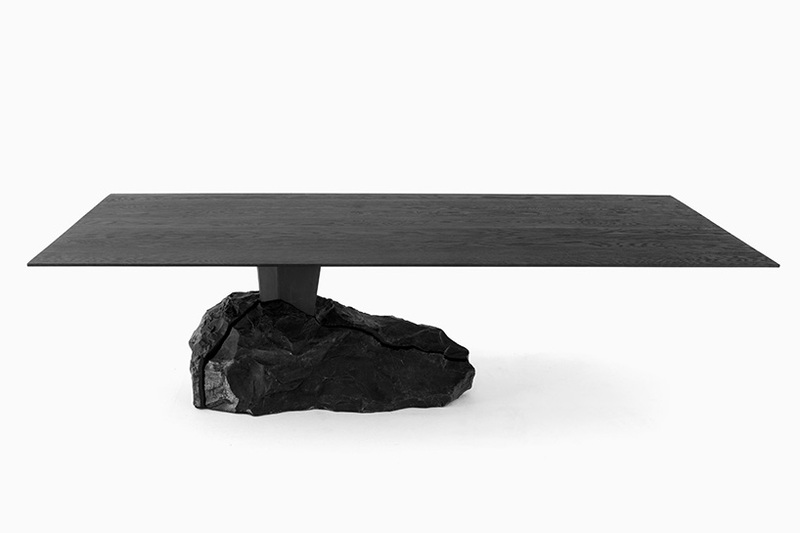 ‘magma light’, created in collaboration with glass lab nouvel studio, is drawn from moulds made in native volcanic stone. glass is blown inside the stone, generating undulating bubbles that vary in shape and thickness.